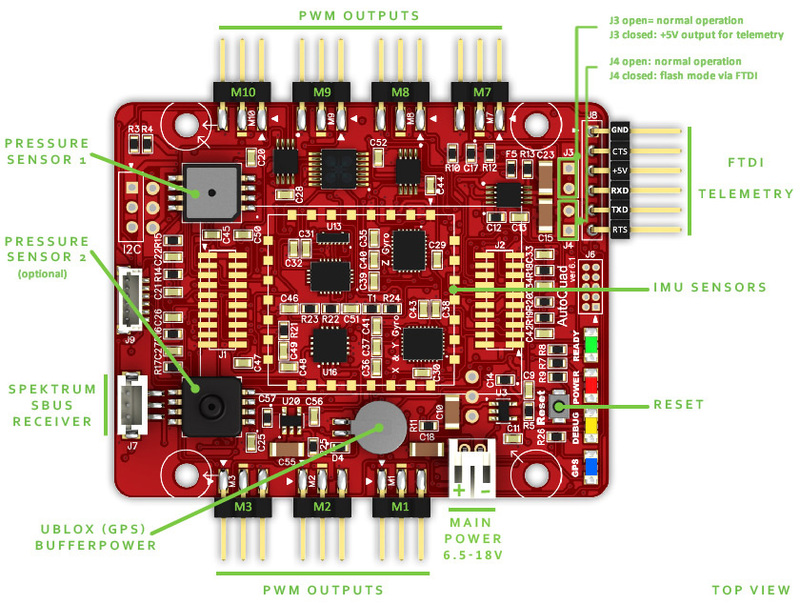 AutoQuad 6 is the current full-sized controller option with 14 input/output channels that can be configured for motors, servos, LEDs, audio signalling, and other uses. 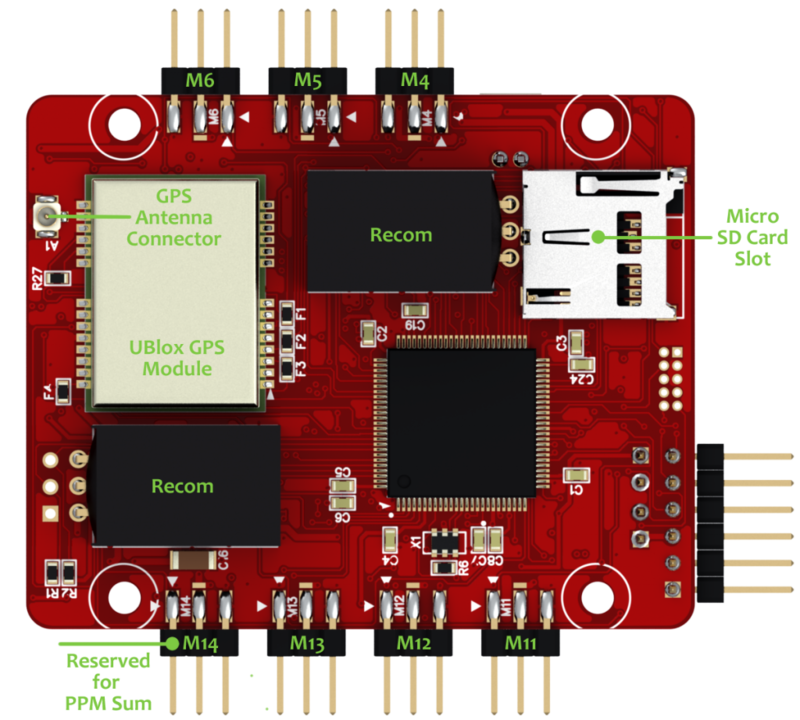 Although the older on-board Analog IMU on the V6 board is fully supported in the software, we recommend upgrading AQ6 board to Digital IMU. Besides improving the IMU performance and greatly simplifying calibration, the DIMU expander adds CAN Bus and 2nd serial port to AQ6. Read more on the DIMU upgrade page. The back with 2 DC-DC converters, Ublox GPS module, uSD card slot, and the heart of the system: STM32F407 MCU. ESCs flashed for 400Hz output or the ESC32. FTDI / USB-Serial adapter for uploading firmware and wired communication. Frame: tri – quad – hexa – octo or any other exotic is possible. Y3 is not supported at this time. RC Gear: A minimum of 6 channels is needed — see radio options. A class 10 micro SD card for calibration and on-board logging. See the recommended list. And last but not least: Lots of time. Reversing the voltage polarity will DESTROY YOUR BOARD INSTANTLY! Get all the additional components needed. Assemble the headers on the AutoQuad. Download firmware and AutoQuad software. Install the Ground Control Station. Flash firmware to the AutoQuad & basic setup. Place the AutoQuad on your new frame. Upload the calculations and perform final setup to the AutoQuad. Run preflight tests and continue to your first flight. This page was created on 18-Jun-12 by jussi. Last modified on 16-Nov-14 by kinderkram.